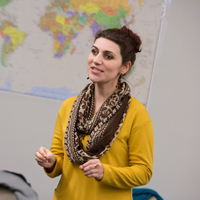 Hasmik Chakaryan will discuss internationalizing counseling as a profession and graduate degree. Eight presenters have been announced for the 2018 Faculty Research Symposium, which takes place this year on Thursday, Feb. 15, during the annual Webster University Teaching Festival. Join us for this showcase as Webster University instructors from a variety of areas will present meaningful research and encourage engaging conversation on topics about which they are passionate. Life in southeast Asia, dance injury prevention, helping students publish and athlete hazing are just some of the topics to be covered by presenters Keith Welsh, Monte Hancock, Bill Russell, Kim Kleinman, Hasmik Chakaryan, Nicole Miller-Struttmann, Con Christeson and Allison Levin. Eight presentations will take place throughout the day in the East Academic Building Room 102, followed by a reception in Room 253 where light refreshments will be served. See the full schedule with links to session descriptions on the Faculty Research Symposium page.